Why am I receiving text message spam from what appears to be GoDaddy? 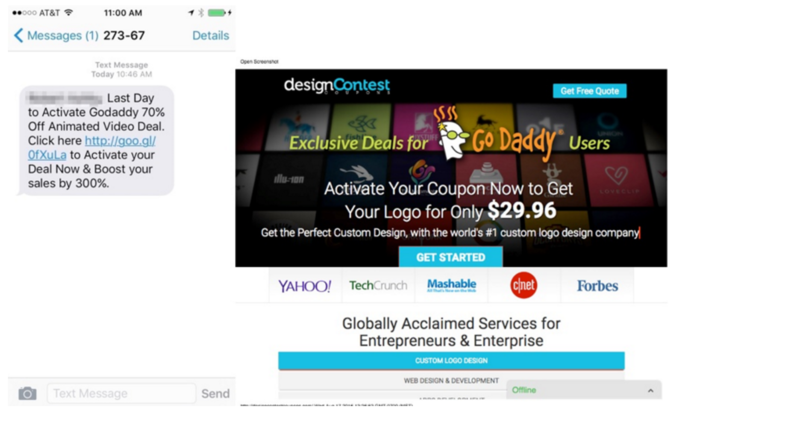 The web design text message you thought was from GoDaddy - isn’t. We recently received complaints about text messages that appear to be from GoDaddy. The messages (pictured below) are actually from a "logo deal" spammer. GoDaddy has neither provided nor shared any customer data with them. Instead, they pulled contact information from the public WHOIS database. Text messages were then generated by the website http://www.route66d.com, which, as of September 20, 2016, was registered through Enom and hosted by HostGator (50.87.144.209). Should you ever receive a suspicious message, please send all details, including any screenshots, to HQ@godaddy.com. Your domain contact information is posted online, accessible by anyone, including hackers. With Domain Privacy, your information stays hidden 24/7. Whenever you register a domain name - with any domain registrar - your contact information is exposed in the WHOIS database. There, it can be accessed by anyone, including spammers. The solution? Domain Privacy protects you from hackers, hijackers, and data miners by replacing your WHOIS information with a generic business address and phone number. It's hidden, but you retain complete control, including the rights to sell, renew, cancel or transfer your domain. Act now and protect your contact information BEFORE it's in the WHOIS database for everyone to see. Use code DBPSAVE50 and save 50%.